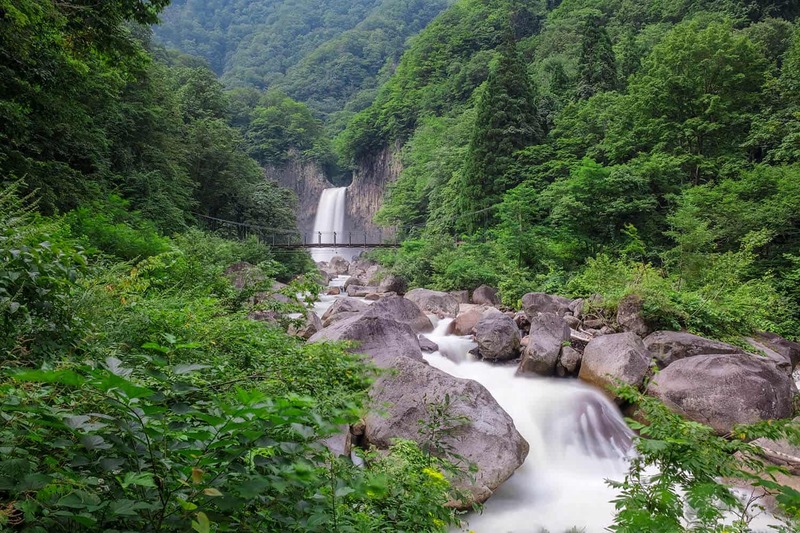 Naena Waterfall is an impressive 55m waterfall. It is framed by a steep basalt wall on each side and the thundering water crashes on to the large boulders below. 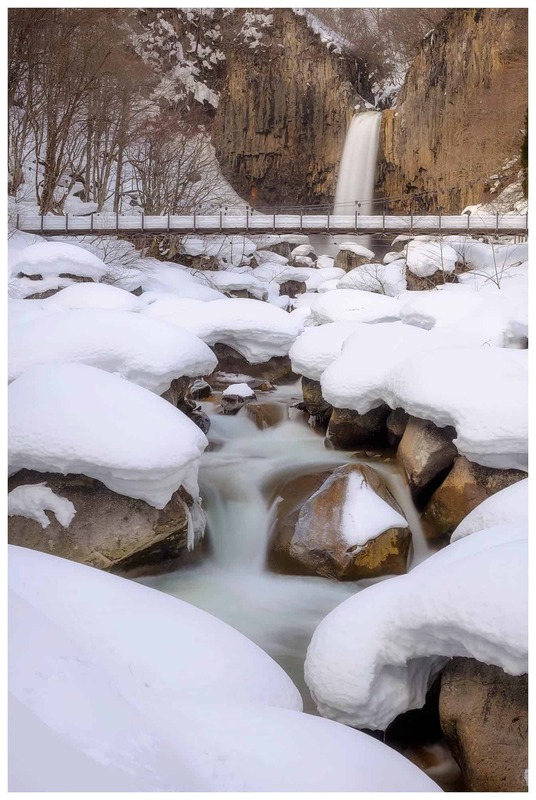 In spring the snow melt from the mountain flows down and causes the volume of water to increase dramatically. The amount of water that comes down at this time is truly impressive. The thundering noise of the water and the spray from the waterfall is almost frightening as you cross the bridge in front of it. 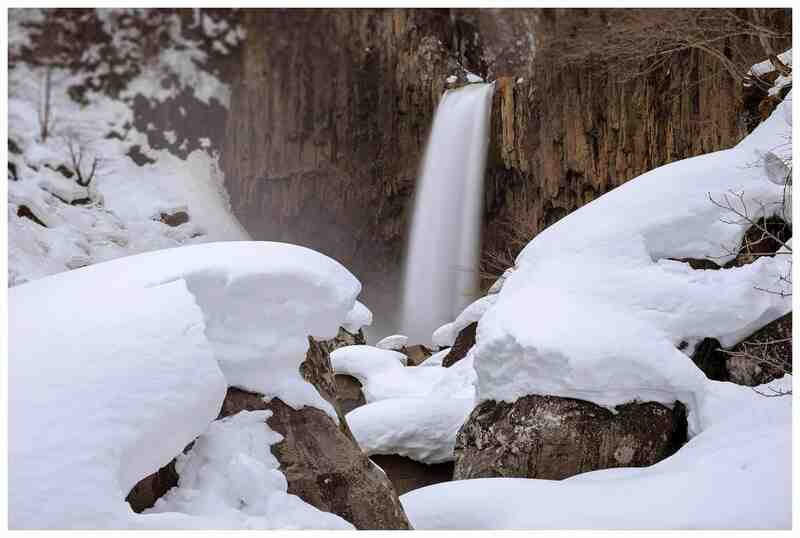 Naena waterfall is beautiful all year round and looks drastically different in each season. In spring, you have the snowmelt increasing the size of the waterfall and new flowers starting to appear. 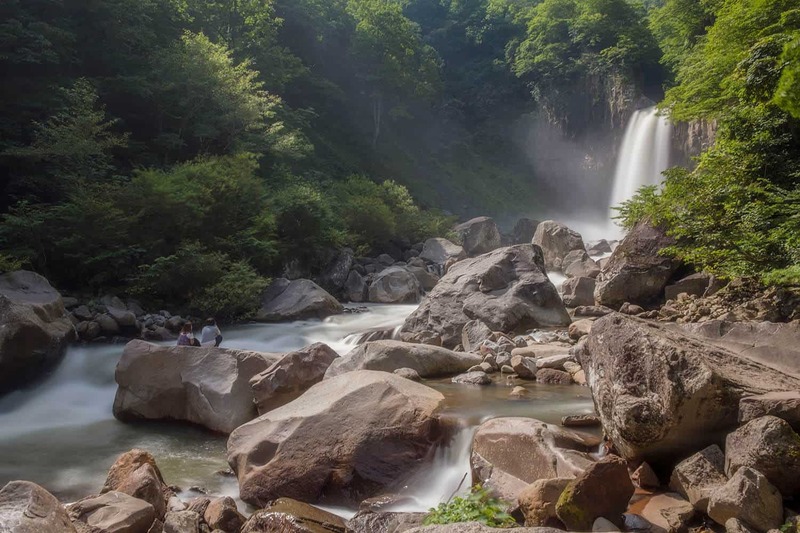 In the summer months, everything is lush and green, the water is calmer and you can climb over the large boulders in the river bed. Autumn is a beautiful season as the leaves start to turn shades of red, yellow and orange. During winter the area is unreachable due to the snowfall Myoko receives. The waterfall is a 10min walk from the carpark area. The walk is not difficult and is level with a gentle incline for most of the way. Children and elderly people can walk there. Just make sure you have suitable footware. There are 3 places to get a bite to eat. They are all found together above the car park area before you begin your walk to the waterfall. The main restaurant (Naena taki restaurant) serves a variety of food. Their most popular dish is called nagashi somen. This is a thin type of noodle that you place at the top of a water spout and the noodles then flow down a pipe with the water and you catch them with your chop sticks. They also have a variety of tempura and fish dishes. Cafe Grand sells amazing ice cream. There are a variety of toppings that you can help yourself to. I always make sure to get a soft cream after walking back from the waterfall. On a summer day, it’s great to sit in the shade and try out all the different flavour toppings. CLICK HERE for the local bus times. A must see location that is easily accessable via bus. One of the most stunning locations in Myoko. The restaurant serves great food and the ice cream is fantastic.